A $31.8m proposed redevelopment of the Gosford RSL Club at 2-20 Yallambee Ave, West Gosford, is currently being assessed by Central Coast Council, before referral for determination by the Joint Regional Planning Panel (JRPP). The application for a two-stage development, to construct a new club and then demolish the existing club, and form a new car park, was lodged with Central Coast Council in April, and has been registered by the JRPP, but no documents lodged or meeting times set. 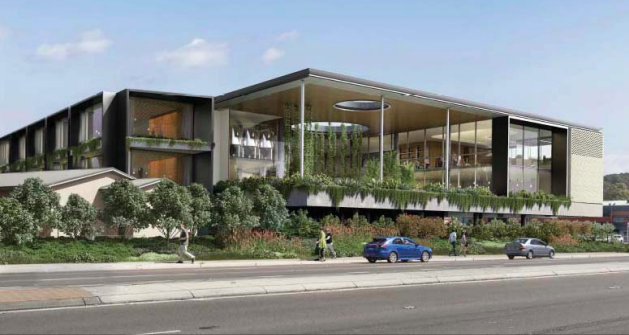 According to the applicant, Central Coast Council has already indicated support for changing its current development control for maximum building height in support of this development. A Statement of Environmental Effects (SEE) submitted to Council in support of the proposal, described the development as “the extension of the existing registered club with a 6,800 square metre club building, and 50 A-grade parking spaces underneath the building. “The floor space of the extension will comprise a mix of function, dining, lounge, gaming and bar facilities, supported by back of house space, including kitchens, food and beverage dispensaries, storage and loading facilities, amenities and administration,” the SEE said. Other parts of the proposal, according to the SEE, would be the demolition of the existing club building, the construction of 154 parking spaces with associated landscaping areas within the footprint of the existing club building and ancillary landscaped areas. “The proponent and consulting team has met with Central Coast Council’s town planning and development service team on two occasions,” the SEE said. “The matters raised in this meeting have been taken into account in the final development concept and addressed in the SEE and supporting technical plans and reports. “Importantly, the proponent has flagged the need to vary Council’s development standard relating to the building height of 8.5 metres to achieve an appropriate design response in terms of functionality and aesthetics. “As provided in meeting minutes, Council has been supportive of the proponent’s intent to vary this development standard.” The proposed development would have a maximum height of 18.1 metres when measured from the ground level to the highest point of the building. “While this represents a substantial numerical departure from the prescribed development standard, the impacts are acceptable and in the context of the site, the surrounds and the proposed development, the proposed height is considered appropriate,” the applicant said. According to the SEE, the site has frontage to the Central Coast Hwy to the north, Yallambee Ave to the south and Narara Creek to the east. The Yallambee Lodge residential aged care facility, operated by Evergreen Life Care, is found to the south east of the site. Narara Creek, to the immediate east, is flanked by dense vegetation, which screens the site to the east and acts as a riparian corridor. Brisbane Water is found further to the south and the site is around 50 metres from the top of the bank of Narara Creek. The site and surrounds are situated on the Narara Creek floodplain. The applicant has argued that the proposal has addressed flood planning requirements by ensuring the upper levels of the development site are located above the flood plain level (FPL). However, according to the SEE, the entry level foyer is proposed to sit at RL1.90m AHD, which is below the FPL, but at the 1 per cent AEP flood level, and therefore should be void of infrastructure prone to damage from flood waters. “Habitable areas within the ground floor (staff offices, cellar, cool rooms etc) are proposed to sit below the FPL, with any electrical or other sensitive infrastructure to be located above the FPL, and car parking levels shall generally reflect existing site levels to retain overland flow paths.” The application acknowledges that although submitted as alterations and additions to an existing Registered Club, ultimately there will be only one club building. “For a short period of time, the existing and new club building will remain on site and will, to satisfy requirements under the Registered Clubs Act 1976, be connected. “Practically, at no point in time, will both buildings be fully operational. “Consequently there will not be a duplication of club floor space. “Following occupation of the new club building, after a short period of time, all activities within the existing club will cease. “Within a period of six months, the existing club building will be demolished and replaced with at grade car parking.” On completion, the proposal will result in an increase in Gross Floor Area of 770 square metres and provision of 291 car parking spaces. During construction, it is anticipated that the car park to the south of the existing club building and peripheral to the Galaxy Motel will remain available to patrons. This would provide around 192 spaces on site. A new entry driveway will be provided 10 metres south of the existing northern entry, but the existing southern driveways would be retained as part of the development. Service vehicles (deliveries and waste collection) will enter via the new access off Yallambee Ave. A dedicated minibus set down area would be provided adjacent to the main entry along with a dedicated covered drop off area adjacent to the main entry.